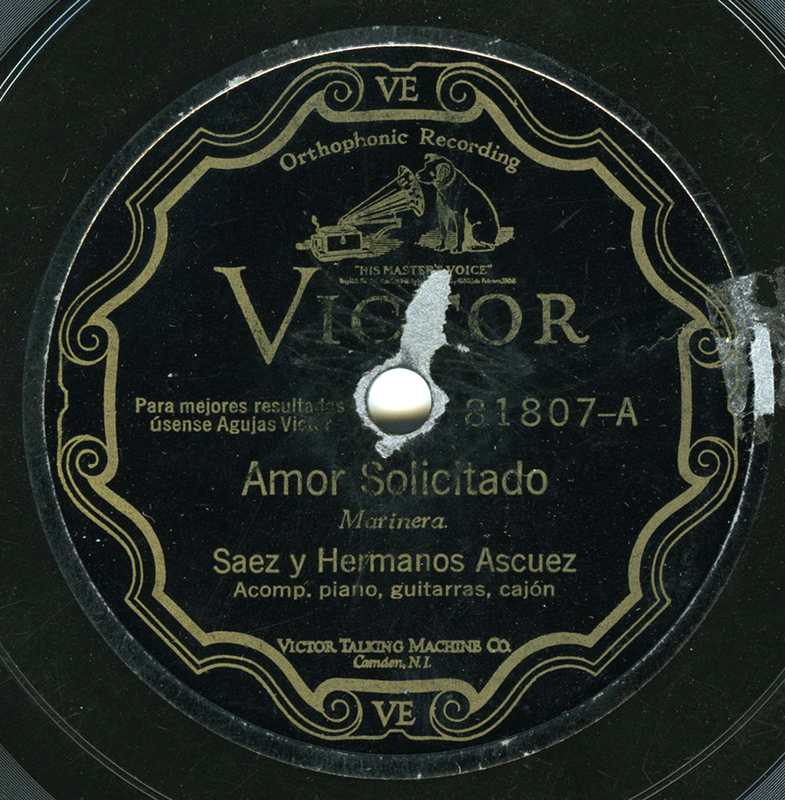 Here’s a selection of three early and rare traditional music discs from Peru, all recorded and released by the Victor company of the United States, and sold in Peru. These have been on my turntable for months now, as I find them incredibly beautiful pieces of music, each in their own way. I’ll get to the music in a moment, but first, a little context and history, which, while kind of arcane, will maybe help paint the picture of what was happening in the industry at the time. The Victor Talking Machine Company was extremely active in South America. In fact, they probably had the largest share of the South American 78rpm market through World War II once they and their sister company, the Gramophone Company in England, made a non-competitive agreement between each other in the early part of the 20th century. That agreement dictated that Victor could record in North and South America, Japan, the Philippines, parts of China, and even a little Southeast Asia. The Gramophone Company, alias HMV, could have….everywhere else! The idea of record companies dividing up the world is a little troubling to say the least, but it was such a new technology and a new market, it’s hardly surprising. And, that’s not to say that Victor was the only outfit recording south of the equator. The German companies, such as Odeon, were active in Argentina and Brazil, in particular. However, Victor was among the first companies to record regional music of Peru. Victor first recorded Peruvian musicians and ensembles in September of 1913. For most of that month, they recorded orchestras, guitar duos, “estudiantinas,” comedians, and military bands. In total 65 discs worth of material was issued of the 128 recordings made, with many different song types represented, and all of them appear to have been recorded in Lima. In 1917, Victor once again recorded a significant amount of Peruvian music, but this time, they began recording regionally, starting their sessions in the south of the country, in the city of Arequipa. One of the first groups they recorded in 1917 was a trio, flute players accompanied by a guitar player, credited only as “Trio Arequipeño de Quenas.” The flute known as the quena is probably the most well-known Andean instrument. Usually made from cane or wood, it goes by many different local names in indigenous Peruvian cultures. The most common form of quena has 7 holes (1 in the back), and is about 30-40 cm long. This piece, “Planta del Desierto” (Desert Plant) was recorded on August 8, 1917, and is an example of the yaraví song style. Yaraví is generally common in the mountainous areas of southern Peru, and is usually played slowly, with a wistful mood. The trio featured here recorded a total of 10 pieces, with 7 of them actually released. Some ancillary information exists for this record. According to notes kept by Victor, this disc sold 3,410 copies, quite a high amount for a regional record of this sort. 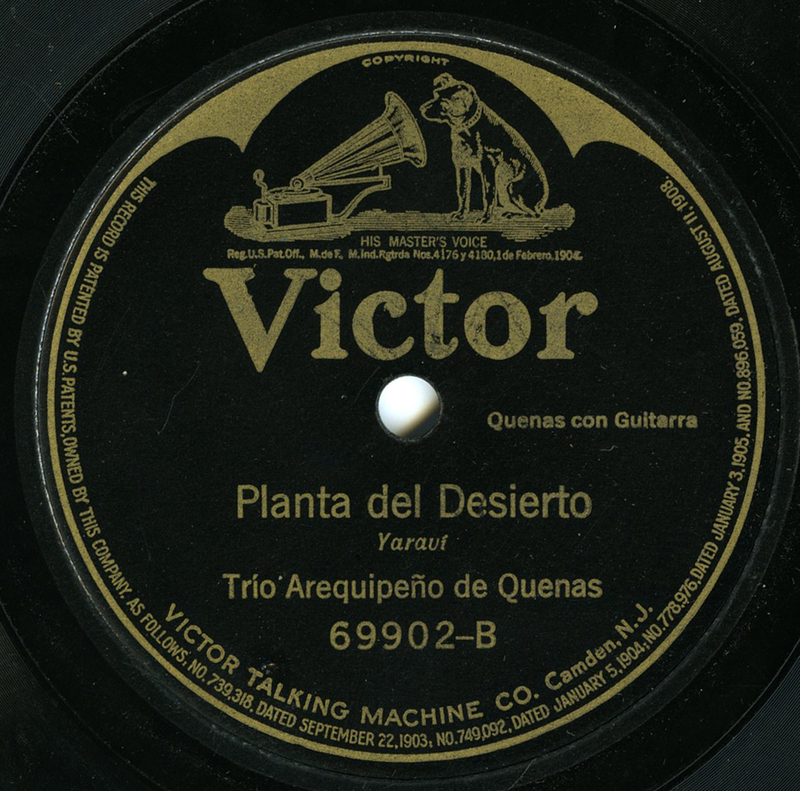 It’s also interesting that within the Victor ledgers, there’s a reference to a salesman in Peru named Riega (apparently in charge of the sessions) stating that he did not like the discs recorded by the Trio Arequipeño de Quenas, and that he could not sell them! Sales figures need to be taken with a grain of salt, however – they are often misleading or flat-out wrong as some discographers have pointed out, and merely exist as a guide. However, this is a good indication that this was a steady seller for Victor (though I’ve never seen another copy). Also of note – the Victor ledger states that the guitarist broke a string and ruined the previous take. The Trio were at the session for over 12 hours that day, nearly 96 years ago. From 1919-1928, Victor did not record in Peru at all – however, that didn’t stop them from marketing music to Peru. Besides all manner of discs being sold in music stores in Peru, Victor was recording a host of solo musicians and bands in New York, and marketing the music specifically to Peruvian stores and consumers. For example, in 1920 and 1921, American bandleader Nat Shilkret recorded some Andean melodies with harpist Francis J. Lapitino under the name “Victor Orchestra.” A few years later, Shilkret recorded dozens and dozens of tracks pressed for the Peruvian market, including Quechua songs, under the name “Orquesta Internacional,” which may have been an attempt to keep the Peruvian market alive. H owever, in March and April 1928, additional on-site Peruvian sessions began in earnest once again, and some amazing discs were recorded. Again, Victor chose Lima and Arequipa as the locations for the sessions. The sessions were organized by Victor’s agents in Peru, F. W. Castellano and Brother, and they yielded nearly 40 discs, which were pressed in the United States, shipped back to Peru, and in Peruvian record stores by August of that same year. Starting in Lima, the Castellanos apparently took advantage of several music contests leading up to the annual Day of San Juan festival, which brought a number of then-renowned local artists and ensembles into Lima for work. One of these groups consisted of Alejandro Sáez along with the brothers Augusto and Elías Ascuez (apparently bricklayers by day, though they were considered popular and respected musicians of the time period, even playing for Peruvian presidents) – they alone recorded the equivalent of 10 discs in 1928 (for some reason, unlike other discs, Peruvian 78s were often artistically split, with a different group featured on each side). This group recorded examples of música criolla, literally “creole music,” which was a kind of coastal, syncretic urban music that developed in Lima due to the gradual movement into the city by various ethnic groups. This piece, recorded in Lima in March 28, 1928, features guitar, piano, and the cajón, aka the “big box,” a wooden box that’s played with the hands and thought to be of Afro-Peruvian origin. The tune is a marinera, a type of música criolla song. Finally, Victor spent two days in late April 1928 recording artists in Arequipa, including the Estudiantina Duncker, a band originally from Puno, the city on the banks of Lake Titicaca. Estudiantinas in Peru were groups of musicians of mixed heritage, mestizo in nature, which played indigenous music in more formal settings, emphasizing traditional instruments coupled with modern ones (violins, for example). The piece I’ve uploaded is Quechua (or “Kehswa” as it is transliterated on the label). The title in Quechua is “Ripusajjña” and its alternate title in Spanish is “Ya Me Voy” (“I Am Going”). 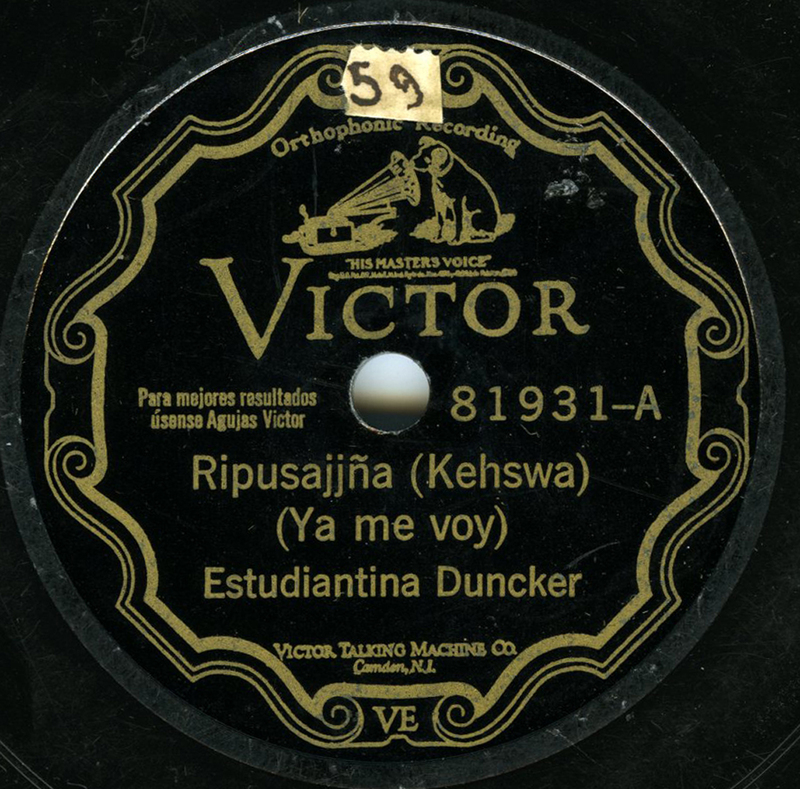 The Estudiantina Duncker recorded 8 sides on April 24, 1928, including four Quechua songs, one Huayno, and one Aymará. It is repetitive, lulling, and terrific music (and in the best condition of the three – Peruvian discs are difficult to find in exceptional condition). Victor continued recording in Peru, and in the following years they got around to issuing music from Ayacucho, Cusco, Acomayo, and all manner of regional music. After World War II, independent labels in Peru began appearing, such as Sono Radio, Virrey, and Smith Records. By then, of course, a generation had passed, and the music, while still vibrant and alive, had changed. Much information gleaned from the Encyclopedic Discography of Victor Recordings and Luis Gomez’s doctoral dissertation on música criolla for Stony Brook University, 2010. How’s the other side on the Estudiantina Duncker record? Is it another group? Just as good or even better? I would help you translate the Saez y Hermanos Ascuez song but it’s hard to make out what they’re saying- as if they barely opened their mouths to sing! It’s very nice. I love these sessions – but yes, like I was saying in the post, virtually all of these Peruvian Victors are split sides. The group on the flip side is Salas y Marroquin, a duo. It’s like they have a case of the mumbles, which also happens on some Puerto Rican records. Sad when you can’t make out what your own people are singing! Buenos días amigos, nos parece interesante su comentario a las grabaciones Peruanas, tengo en mis archivos algunas mas de ellas desde 1911 en que grabaron los músicos peruanos para el sello columbia (dúo Montes y Manrique), después las grabaciones de 1913, 1917, 1928 y las grabaciones de 1930. Quisiera saber de donde sacaron la información de la cantidad de discos vendidos por la victor, ya que en la pagina de la EDVR no figura (o al menos no ubique ese dato), me gustaria que por favor me pudieran brindar ese tipo de informacion sobre la venta de los discos victor. Thank you, Gino! I’ve sent you an e-mail. Amazing that Columbia was there in 1911! Luis – Por favor, busque en este sitio web, y este vínculo, que enumera otras grabaciones realizadas en Arequipa.